WASHINGTON (AP) -- President Donald Trump tweeted Tuesday that Democrat Rep. Ilhan Omar's newest remarks about Israel mark a "dark day" for the Jewish state. His comment came as House Democrats prepared a resolution by Speaker Nancy Pelosi and other Democrats, declaring that the House opposes anti-Semitism and bigotry. Some Republicans and Jewish groups are pressuring Democrats for stronger action, including potentially removing Omar from the prestigious House Foreign Affairs Committee. Omar's remarks have inflamed Democratic divisions over Israel, and Trump lobbed a tweet into the uproar. "Representative Ilhan Omar is again under fire for her terrible comments concerning Israel," he wrote, referencing what he said were "Jewish groups" demanding she be stripped of her committee seat. "A dark day for Israel!" 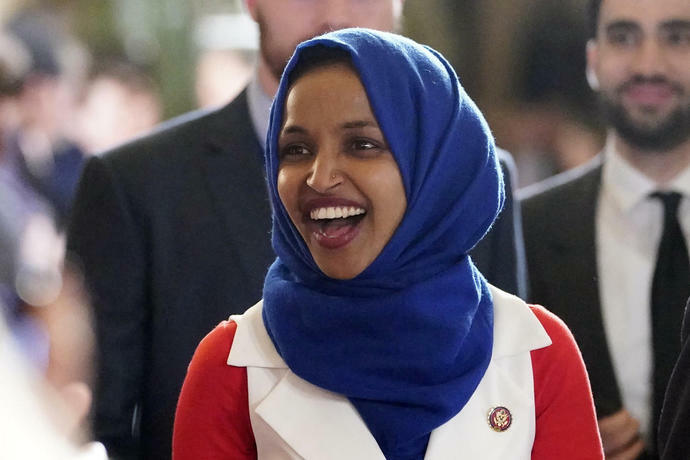 It was the latest chapter in a series of clashes between Omar and American supporters of Israel in Washington, where the Minnesota Democrat has been celebrated as part of a new generation of House members that is more female and more diverse than any in history. Last month, Omar ignited a bipartisan uproar in Washington and Minnesota when she suggested on Twitter that members of Congress are paid by the American Israel Public Affairs Committee to support Israel. AIPAC is a nonprofit organization that works to influence U.S. policy. She apologized for that remark, but Trump called her mea culpa "lame" and said she should resign from Congress or at least not be allowed to serve on committees. For a few weeks, the matter quieted. But last week, Omar said at a Washington bookstore that she worries that everything she says about Israel would be construed as anti-Semitic. She used language that, to many ears, evoked a longtime trope about American Jews having divided loyalties. Israel's supporters, she suggested, are pushing members of Congress to pledge "allegiance to a foreign country." It's at least the third time the Minnesota Democrat's words have put her colleagues in a more delicate spot than usual on the U.S.-Israel relationship, and the second time in two months that she's drawn a stern backlash from party leaders. Prominent Democrats, including House Foreign Affairs Chairman Eliot Engel, demanded another apology from Omar and began over the weekend to write the resolution. A draft offered to news outlets, including The Associated Press, does not explicitly rebuke Omar, a Somali-American and one of two Muslim women in Congress. But it sets out the history of anti-Semitism and bigotry in America, including anti-Jewish tropes about divided loyalties. The document also rejects bigotry directed against Muslims after the Sept. 11, 2001, attacks.